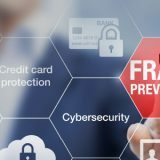 The pace at which new security threats are being introduced and propagated online has reached exponential levels, gaining speed with each passing year. Organizations have more locations and devices to protect, and threats are using many different ports to try to gain access or exfiltrate data. Security teams are often understaffed and struggle with complex, siloed systems that do not integrate or share intelligence in a programmatic way. These teams need solutions that are easy to deploy, simple to manage, can scale exponentially, and can integrate with other tools. Securing your wireless users from malicious attacks — particularly these “DNS blind spots” that exist in many networks and are exploited by 97% of advanced malware — is of paramount importance. Unfortunately, recent surveys indicate that 75% of organizations do not actively monitor and apply security for DNS. It is within this context that we are excited to announce support for integration between Meraki MR wireless access points (APs) and Cisco Umbrella (formerly OpenDNS). Umbrella is the industry’s first secure internet gateway, a cloud-delivered first line of defense against threats like malware, ransomware, and phishing. Umbrella enforces security at the DNS layer by identifying requested web domains hosting nasty stuff — malware, phishing, etc. — and block end user access to them. Umbrella also enables more secure DNS querying through a tool called DNSCrypt, which automatically encrypts DNS queries between your network and Umbrella’s servers, effectively eliminating the chance that your queries will be the victim of eavesdropping or man-in-the-middle (MITM) attacks. This secures the “last mile” of a client’s internet connection, which is often left exposed and vulnerable. 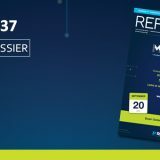 There is no additional cost or charge for taking advantage of this integration (which is available to all Meraki wireless customers who have upgraded to our latest MR26.x firmware), but Meraki wireless customers who wish to integrate with Umbrella will need a separate Umbrella license and account with that service. So, what does this mean for admins of Meraki wireless networks? This integration with Umbrella enables Meraki admins who obtain Umbrella licenses (WLAN, Professional, Insights, or Platform) to seamlessly assign DNS filtering via Meraki group policy or SSID to specific subsets of wireless clients, or to them all. Enabling Umbrella integration takes only a few steps. First, the Meraki and Umbrella dashboards must be linked via the Umbrella Network Devices API key. Once this API key is generated from within the Umbrella dashboard, it needs to be copied into the Meraki dashboard by navigating to Network-wide > General. Once the Meraki and Umbrella dashboards have been configured, linking a Meraki SSID or group policy to an Umbrella security policy is easy (note: Meraki group policies must be set to use ‘Custom SSID Firewall & Shaping Rules’ to link an Umbrella policy to them). After this initial setup, a unique identifier is generated behind the scenes for the specified Meraki SSID or group policy and is used by Umbrella to determine how to evaluate traffic from that Meraki network moving forward. 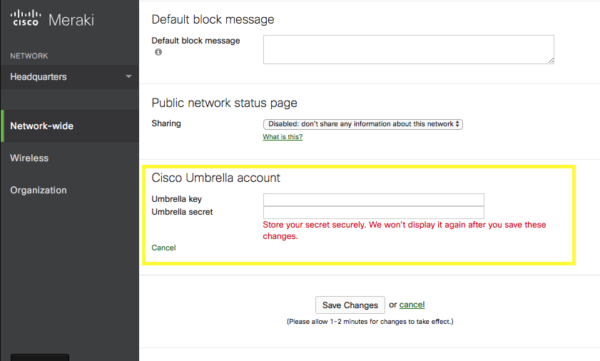 To link a Meraki SSID to an Umbrella policy, navigate to the Wireless > Configure > Firewall & Traffic Shaping section of the Meraki dashboard. There, you will find a button to link Umbrella policies. By default, the last policy physically listed in the Umbrella dashboard’s ordered policy list will be inherited by a Meraki SSID unless a different policy is selected from the dropdown list. 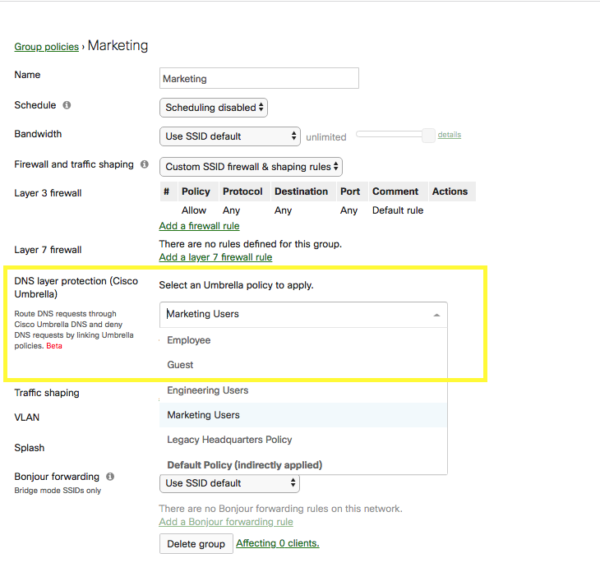 To link a Meraki group policy to an Umbrella security policy, navigate to the Network > Configure > Group policies page in the Meraki dashboard and choose the specific Meraki group policy that you want to link. Under the ‘Layer 7 firewall rules’ section of that policy, you’ll be able to choose which Umbrella policy you’d like to apply. Once a Meraki SSID or group policy has been successfully linked to an Umbrella security policy, clients connecting to that SSID or who have been applied that group policy will have their DNS queries encrypted (if the AP supports 802.11ac) and verified against the corresponding Umbrella policy. Encrypting DNS queries between Meraki APs and Umbrella DNS endpoints helps secure the ‘last mile’ of client web browsing and protects against devastating MITM attacks or packet snooping that can reveal which websites client devices are browsing. An example Umbrella policy may prohibit access to known malicious web domains or websites that host specific types of content, like gambling or peer-to-peer domains. If the client’s request for access to a given website is allowed, Umbrella will return an encrypted DNS response with the appropriate IP address. If the request is denied, then an encrypted DNS response pointing to the Umbrella block page will be returned instead. Taken together, Meraki wireless and Umbrella integration provide a significantly more robust security framework for IT admins looking to protect clients from web threats in a more proactive way. Instead of waiting for a malicious site to infect a machine and then using tools like antivirus to detect and remediate, Meraki MR customers can rest easy knowing that they are protected from ever reaching harmful sites in the first place. Interested customers should contact Meraki Support to have this feature enabled. This feature requires an early-release MR firmware version that can be enabled with Meraki support assistance. 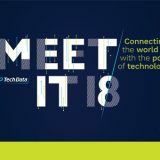 To find out more, speak to your Tech Data specialist today. Vorige bericht Geef uw business een boost met de Autodesk® LT Family producten!